Yesterday we reviewed Faith Hill True, and now it’s time to move on to her husband and Tim McGraw Silver. I liked McGraw by TimMcGraw and thought Silver was worth a try. 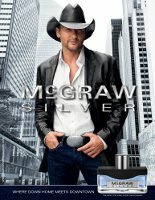 Perfumer Maurice Roucel developed Tim McGraw Silver. The fragrance launched in 2010 and includes watery aromatic notes, green leaves, sequoia wood, lavender, orange flower, vetiver, musk, sandalwood and saffron. Silver is a fulsome fougère with its cool lavender warmed by wood. Some of the wood is soft, like sandalwood, and some smells coniferous, but not as sharp as pine pitch or cedar. The fragrance’s orange flower and musk might be intended to inject a soapy clean feel, but if so, the rest of Silver swallowed it whole except for a thin wash on its edges. I was tantalized to see saffron listed in the notes, but that, too, is subtle and hard to tease out. Basically, Silver packs lots of attitude, pulchritude, and warmth. It’s big, and to me it’s more interesting than many fougères out there even if it isn’t jaw-droppingly original. But it’s also a little like the guy who drives a Hummer. You have to ask what he’s compensating for. 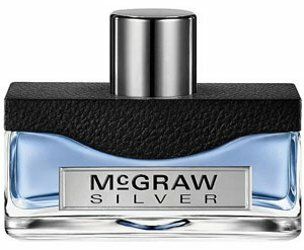 Tim McGraw Silver cologne spray is available in 30 ml and 50 ml sizes, and costs between $11 and $35, depending on where you buy it. It’s available online and from many drugstores and big box retailers. 1. For newer perfume enthusiasts, “fougère” means “fern” and is a type of fragrance featuring lavender with coumarin and moss. Don’t ask me why a perfume named “fern” smells of lavender. 2. Really, not many fragrances can embrace lavender and still be subtle. To me, Guerlain Jicky succeeds, but not everyone can pull it off (although that might be more about the civet than the lavender). The same goes for Christian Dior Dune. Patou Moment Supreme might be one of the easiest lavender-centric fragrances to wear. Ahhh…I think I fell in love w/ my boyfriend at the time because he wore Drakkar Noir…and then years later I married him. And yes, he still has some. Nice review, thank you. Great story! One thing I can say about Drakkar Noir is that it has, perhaps, the most fabulous name in men’s fragrances. Well, second best when you count Hai Karate. gotta love those 1980’s scents! Some of them, at least! Dont you mean Hai Karate! I remember that exc.\laimation point. So even though Maurice Roucel, one of my favorites noses, is behind this, I don’t think it will go on my sample list. Yes, as prevalent as fougeres are, it’s the rare man who can pull one off well. Apparently middle-schooler Bruce Wylie doesn’t make that cut. Thank you for the review. I really enjoy drugstore week. I love fougeres–I might need to give this one a sniff. Caron Pour Homme is another easy to wear lavender scent. Oh, I love Caron Pour Homme! Thank you for reminding me of it. A great lavender scent was Tailoring for Men that Clinique made in the late 80’s – early 90’s. There are a few bottles of it on eBay or sites like that selling for big dollars. If the fragrance companies had any brains they would research which vintage fragrances are selling for big bucks and then start making them again. The public is doing their market research for them, but they’re ignoring it. I’ve never heard of Tailoring for Men! It sounds pretty rare. I love your idea for re-launching old perfumes, though. Obviously, there’s a market if the fragrances are done well. haha, I’d absolutely buy that! I wouldn’t be surprised if it made a little splash! I’m kind of surprised he hasn’t already, really. Everyone else has. Naturally, he’d need to do an accompanying song. I’d say it could be a parody of a perfume, but there are enough perfumes that seem like self-parody it’d be impossible to tell the difference. That’s an excellent point. I can’t tell you how many times I’ve read perfume copy and thought, This has got to be a joke. Gotcha! When you say you don’t differentiate between male and female fragrances except for fougere, you say that from a woman’s perspective. Since I’m all for gender equality are there any supposedly female smells that men can’t wear? One of the few female fragrances I won’t wear is Mitsouko. Even though many discerning men *have* been wearing it through the years, Chaplin and Diaghilev amongst them, I find it almost intimidatingly womanly. I can’t pinpoint excactly what it is. The peach maybe? Certainly not the chypre base. Two notes that are too, too much for me are tuberose and gardenia. Any other flower I can wear with confidence. And I don’t wear fougeres. Except for Jicky of course. You’re right! I was completely looking at it from the stance of what I’d wear, from my gender (and my comfort zone, too). I’m surprised about Mitsouko. But it sounds like you’ve given it a thorough try, and you’d know. Can you wear L’Heure Bleue? I can see where gardenia and tuberose might be over the top. 2. Its too bad the PR department seems to regard McGraw as a generic male model. Tim McGraw is a country singer/songwriter, of the good ole boy traditional twang variety, not the “modern” variety of country (power pop with conservative lyrics) and not the guy with a “modern style” image of city sophistication. I don’t know anyone who thinks of themselves as modern and cool who admires Tim McGraw or his music (I think he’s darn good, but I make no claim to be cool). The PR department could have taken the same notes and build up an image of the moutain woods, a creek fed swimming hole, (woods, water, the sunshine breaking thorugh the shade trees and the silverly outline of the sun on light green leaves). That would actually communicate the essential nature of a fougere, and probably appeal to more McGraw fans. 3. Fougeres can skew masculine, but I wear them. #2: exactly. We can all see through the put-on. Be authentic. Sheesh. Meaning PR people of course!